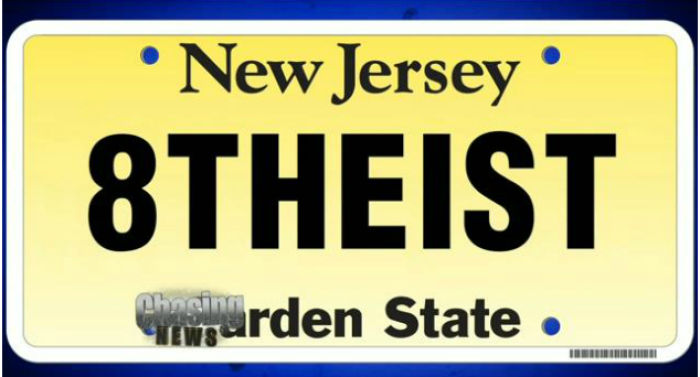 A New Jersey resident is suing the state for rejecting her request for vanity license plate "8THEIST." Shannon Morgan had her license plate request rejected by New Jersey's Motor Vehicle Commission website with a message reading: "requested plate is considered objectionable." Morgan then entered "BAPTIST" into the system and it was accepted, according to N.J. Advance Newspapers. A U.S. District Court judge rejected an attempt by the state of New Jersey to dismiss Morgan's lawsuit that was filed last year. State officials claimed there was an error with the computer and that the MVC was not discriminating against atheism. They added that Morgan was allowed to create the "8THEIST" plate at a later date. Fellow New Jersey resident David Silverman's submission for a plate that read "ATHE1ST was also rejected. Morgan's lawsuit touched on this case. "The commission thus has a practice of denying personalized license plates that identify vehicle owners as atheists, thereby discriminating against atheist viewpoints and expressing a preference for theism over non-theism," stated her lawsuit. U.S. District Court Judge Freda Wolfson ruled this week that Shannon's suit can move forward. "Plaintiff's intention to continue to participate in the personalized license plate program places her within the ambit of the enforcement of the rule and, thus, qualifies as an alleged future injury, particularly in light of the MVC's initial denial of plaintiff's request, its initial denial of fellow atheist Silverman's request, and its continued classification of the '8THEIST' license plate as offensive on its website," Wolfson ruled. The Americans United for the Separation of Church and State are representing Morgan in her suit and told The Associated Press last month that the fact that there have been two incidents with atheist themed license plates show that the issue is not being handled by New Jersey officials. The organization says the MVC is "disfavoring atheist plates and not fixing the system." "Whatever Internet glitch there might be cannot be the explanation this time," said Ayesha N. Khan, legal director for Americans United. Atheists claiming discrimination is nothing new. Al Stefanelli, an atheist activist leader and author told The Christian Post in 2012 that he thinks non-believers are marginalized and stereotyped in the United States. "We are considered the least trustworthy minority in the country, have lost jobs and been shunned by friends and family due to our lack of faith, are routinely demonized and accused of worshipping Satan. And those of us who happen to hold a public office are held under scrutiny by the religious right in a way that can only be described as a witch-hunt," wrote Stefanelli. "I can go on almost indefinitely with examples of this, up to and including threats against our lives, only because we do not believe in God." Christian thinkers, such as apologist Mark Mittelberg, said the aggressive nature of atheists like biologist Richard Dawkins isn't helping their cause. "I would venture to guess that the advice Richard Dawkins gave to atheists at the 'Reason Rally' — to ridicule and mock religious people in public — is not the best way for them to become a more highly loved group of people!" he commented to CP. "What a contrast to the Apostle Peter, who told us, as Christians, to speak to people 'with gentleness and respect' (1 Peter 3:15). And, of course, Jesus told us to 'turn the other cheek' and to love our enemies."